Sally holds an LLB with Honours from the University of Aberdeen and a Diploma in Professional Legal Practice from the University of Glasgow. She has varied practical experience within the areas social welfare and human rights law. Since 2013, Sally has spent time working or volunteering within homelessness prevention for various law centres and charities. 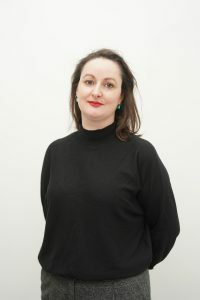 In particular, she defended eviction and repossession actions as a lay representative at Sheriff Courts throughout the North East of Scotland as part of a Scottish Legal Aid Board funded project aimed at increasing access to justice. Since starting her Traineeship, she has been assisting Govan Law Centre’s Prevention of Homelessness Project with their legal advice service at a winter night shelter, gaining experience in Judicial Review relating to homelessness. During 2016, she carried out a work placement with a leading human rights firm, where she assisted with an Article 3 (Inhumane and Degrading Treatment) and Article 8 (Right to Private Life) test case in relation to the use of restraints on prisoners. This allowed her to develop her knowledge of human rights law and gain experience in bringing a test case. Sally has a strong commitment to the law centre movement and the provision of community led legal advice services. She is delighted to be undergoing her traineeship with Govan Law Centre. There has been a clear increase in precarious work, with the rise of the ‘gig economy’, zero-hours contracts and enforced low paid self-employment. The Brexit agenda also poses a threat to basic employment rights and is increasing the risk of exploitation for EU migrants. A particular aim of the project will be to work with the Roma community in Govanhill to tackle exploitative employment practices. The project will seek to increase Public Legal Education in relation to fundamental employment law rights with a particular focus on vulnerable or marginalised EU migrants, young adults and those in precarious work. The overall aim of the project will be to provide workers’ who may be marginalised or vulnerable or otherwise at risk of exploitation with access to legal advice and representation. Further, the law centre will bring strategic litigation and seek to influence policy and law making for the benefit of those using the service.